GO ON and learn all the amazing facts about our PPS sealant. You will be sure not wasting your time now but saving all your money, time and elbow grease in the future from not having to wax your car again and again. UNBELIEVEABLE ? BELIEVE IT ! All painted surface especially your car paint will deteriorate over time by environmental hazards as it is under constant exposure to UV sunray, industrial fallouts, acid rains, bird droppings, road tars, tree saps, bugs, exhaust gases and etc, the list goes on. 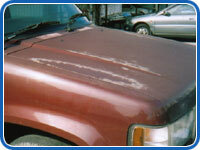 If left unprotected, your car paint will soon become oxidised, discolored, dull, lifeless and damaged beyond salvation. The wax that was applied to your car paint simply will not last long (good for only a few weeks) to provide the permanent protection to shield it from the abovementioned hazards because when wax gets hot from the exposure to heat from the sun and your car engine, it starts to melt and before it is washed away, it become sticky and attracts more dirts and pollutants to it and makes your car looks even more dirty and untidy with dirt streaks and water marks all over the car body which is exactly what you don't like to see and touch. It is also a fact that all waxes need to be re-applied every few weeks and the worst is you could only re-apply the new wax after hard polishing off the old deteriorated wax residue and the dirt that sticked to it. Generally, all waxes do not protect your car paint from UV sunray except to give your car that showroom shine temporary. The use of silicones in certain types of liquid polishes are much more durable than wax polishes. Silicones were first introduced in a liquid polish for automobiles, planes and boats in the mid 1950's. They were easy to apply, had a greater depth of shine and endured many times longer than waxes. Silicones had a lot going for them but they had drawbacks that created nightmares for paint shops to repaint the surface. Silicones can "crosslink" and "drift" into the painted surfaces and penetrate into the pores of the paint. It is this penetration that has given paint shops so much trouble. Every time the surface is washed, the silicone will be driven deeper into the paint. It will continue to "drift" down into the prior coats and eventually into the base metal. As the silicones penetrate and drift further into the painted surface, they leave the surface exposed to the harmful elements just as waxes do when they melt and are washed off by detergents. Once silicones have permeated the paint, the primer and the base metal, the new paint that was sprayed over the surface cannot adhere properly to the surface. The silicones make the new paint "foam" which causes minute pockets of air in the newly applied paint. This is called "air entrapment". As the paint is curing and the solvents are flashings off, the tiny pockets of air will slowly work their way to the surface and create what is called a "pin hole". Sometimes these entrapped air pockets cannot reach the surface before surface has cured, and they become entrapped. Hence, three months later, when the paint has cured and with the vehicle left out in the sun the paint softens and the entrapped air expands by the heat will escape from beneath the paint and create more pinholes ! Depending upon the quality of the formulation, silicones will hold their protection for approximately 6 to 12 months. Their demise eventually comes from their ability to drift. They will drift all the way to the base metal ! Conclusion : All waxes, silicones and other sealants are not the answer for long term shine and protection you need for your car paint ! 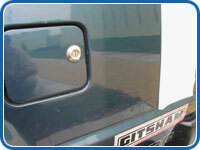 The door on the left was treated with PPS at the same time when the door on the right was polished with wax. The door on the right look dull and dirty with dirty streak mark caused by melting wax. The paint was sprayed a year ago and you can clearly see that it has oxidized faded and discoloured except for the area which was covered by a sticker which helped to protect it from UV sunray. 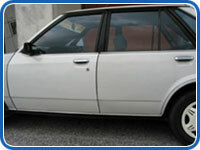 You would not have noticed the discoloration or remember how brilliant was your car original paint if not because of the sticker that had helped to preserve the original paint condition. The paint on the bonnet (which is the most vulnerable to the direct UV sunray and heat from the engine) of this vehicle has oxidized beyond salvation. PROTECT NOW FOR THE FUTURE BEFORE IT IS TOO LATE !